Traditional latkes – or potato pancakes – are neither gluten free nor vegan, but they’re getting a complete makeover in today’s recipe for Gluten Free and Vegan Latkes, with a twist! 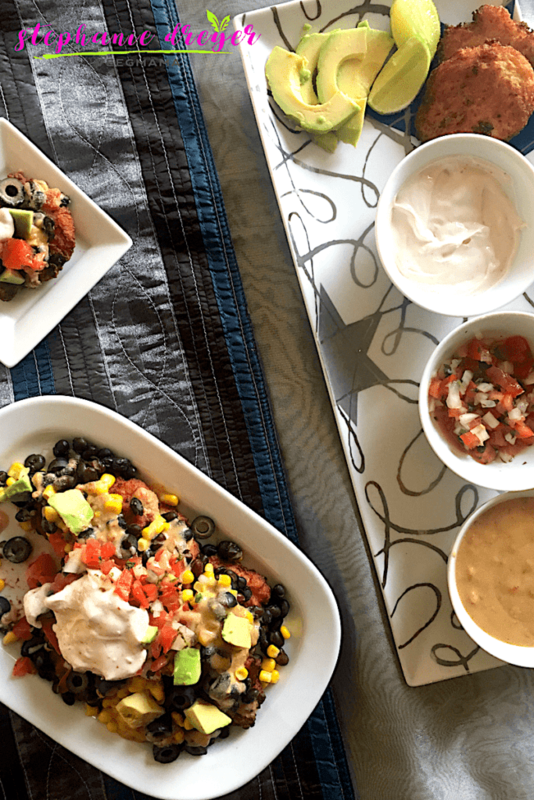 Top your latkes with vegan cheese sauce, lime crema and other Mexican toppings to make savory, comfort-food worthy Vegan Latke Nachos – a must make this season no matter what holiday you celebrate! Hello friends! I hope you enjoyed your Thanksgiving festivities! 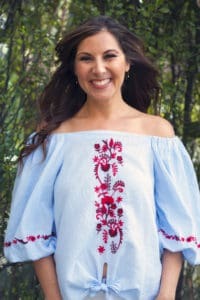 I was so excited when Stephanie from StephanieDreyer.com (previously VeegMama.com) said she wanted to guest post on Vegan Chickpea. Stephanie is an award-winning author, freelance writer, blogger, and mom. She converted to Judaism over a decade ago, and has spent many hours figuring out the best way to make vegan latkes. Most of you probably don’t know that I’m half Jewish. My dad’s side of the family is Jewish, and we grew up celebrating both Hanukkah and Christmas (my mom’s side is Catholic – interesting mix there, huh?!). I love that I got a taste of both religions, and even know the Hanukkah prayer in Hebrew (though admittedly, that is the ONLY Hebrew I know!). Thus, I really wanted to have a special Hanukkah recipe on the blog this year, and walah – Stephanie showed up! 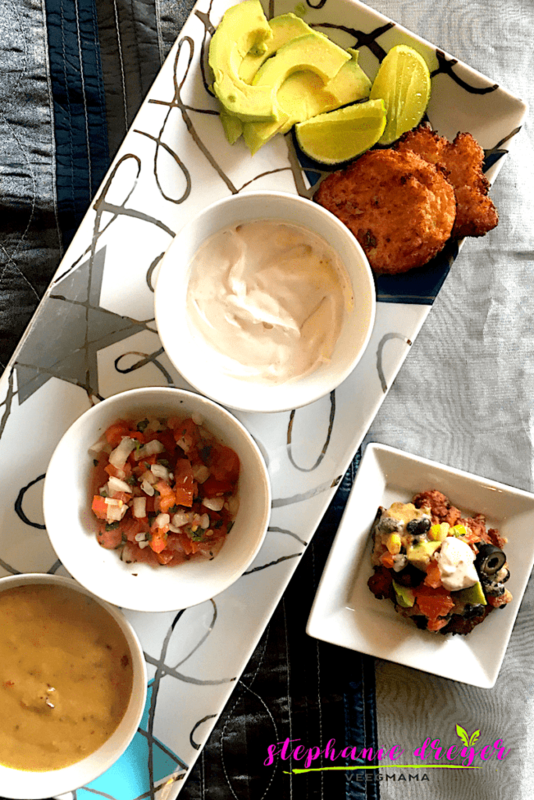 🙂 Hanukkah starts December 12th, so bookmark this recipe and get your latke nacho bar ready to celebrate! Drumroll please for Mrs. Stephanie Dreyer! Latkes, (aka potato pancakes), are a traditional Hanukkah food fried in oil and topped with sour cream or applesauce. My family wants these crunchy treats all eight nights of the “Festival of Lights” so I challenge myself to get creative each year with lots of ways to eat them. Traditionally, I make them with Russet potatoes, but my family also loves my egg-free Sweet Potato Latkes, topped a dozen different ways. 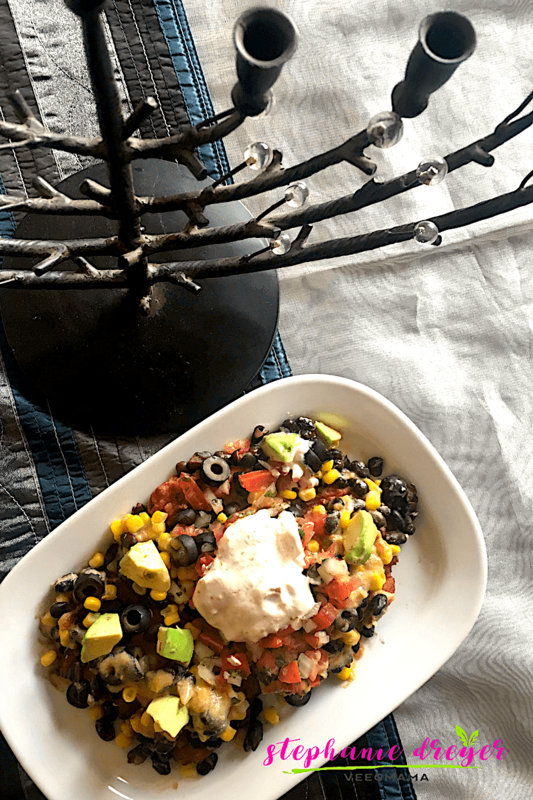 My kids love nachos so I created this Latke Nachos recipe as a fun twist to the traditional Jewish holiday favorite. The holidays are a time to indulge and these Latke Nachos do just that! The crispy fried tastiness of the latke makes it an easy swap for the traditional tortilla chip used in nachos. 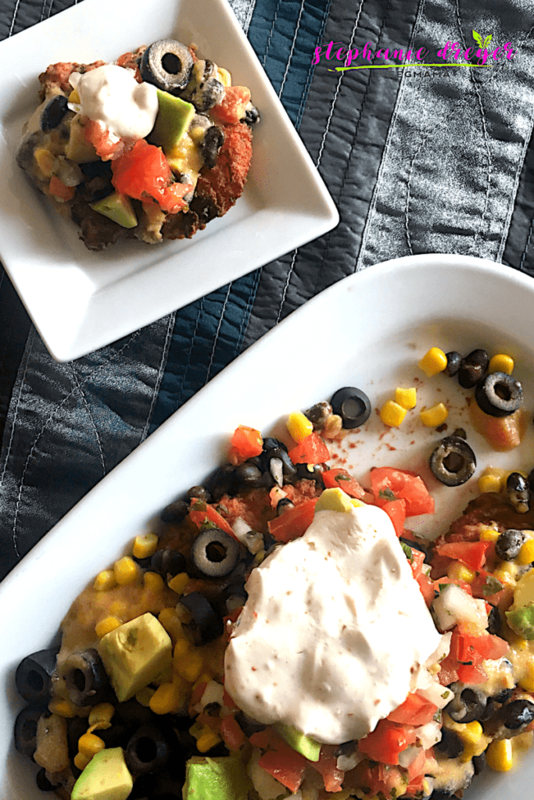 Instead of sour cream or applesauce, I have drizzled these Latke Nachos with a dairy-free nacho “cheese” sauce and topped them with all the fixings you’d expect on nachos – green onions, pico de gallo, sliced olives, and chopped avocado. I also created a luscious dairy-free lime crema to dollop on top. These Latke Nachos are a mouthful! Make sure the oil is hot enough before laying your latkes into it. Once I have shredded the potatoes and onions, I scoop everything into a clean kitchen towel and wring it out directly into the sink. Once I get all the liquid out that I can squeeze, I empty the contents into a large mixing bowl with the rest of my ingredients. Make sure you pour only a thin layer of oil into your frying pan. Too much oil will cause the latkes to fall apart and take longer for them to cook. You also want to make sure the oil is hot and “fry ready” before placing your latke “chips” down into the pan. To test it, place the handle of a wooden spoon into the oil. If the oil sizzles, it’s ready to go. Whether or not you’re celebrating Hanukkah, I hope you enjoy this recipe. Let us know how you’ll top your Latke Nachos! Stephanie Dreyer is a freelance writer and the founder of StephanieDreyer.com, where she helps families eat and cook healthier. Her children’s book, Not A Nugget, and eBook, VeegMama’s Guide To Going Vegan, are both available on Amazon. 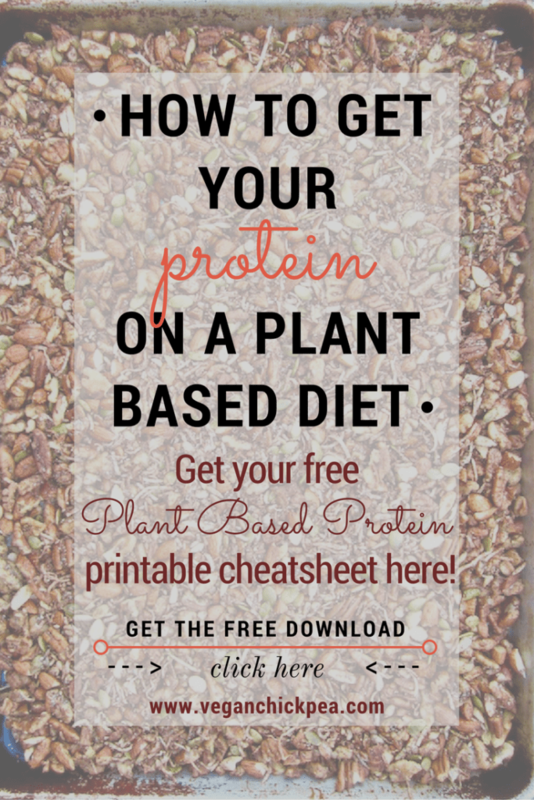 Visit her at StephanieDreyer.com for more plant-based recipes, meal planning resources, and cooking tips. Traditional latkes - or potato pancakes - are neither gluten free nor vegan, but they're getting a complete makeover in today's recipe for Gluten Free and Vegan Latkes, with a twist! 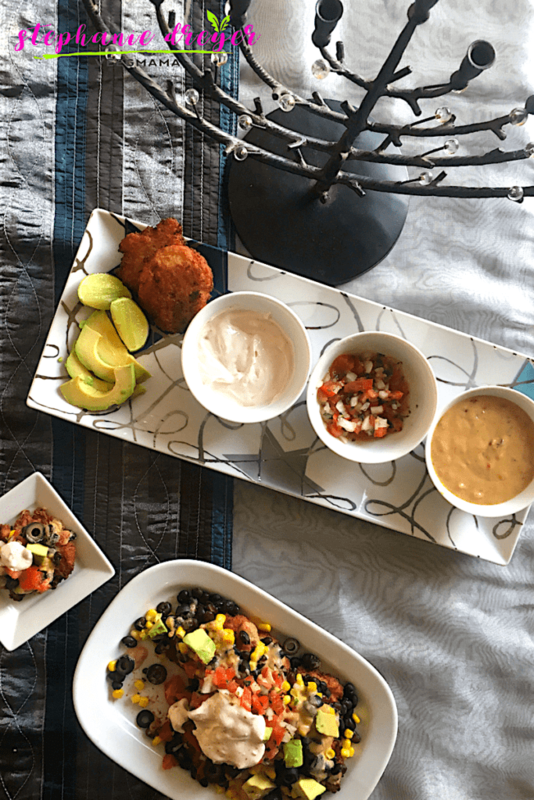 Top your latkes with vegan cheese sauce, lime crema and other Mexican toppings to make savory, comfort-food worthy Vegan Latke Nachos - a must make this season no matter what holiday you celebrate! MAKE THE CHEESE SAUCE: Heat the flour and nutritional yeast in a saucepan for about 3-4 minutes. Stir in the almond milk and whisk continuously to avoid getting any lumps. Continue whisking for about 5 minutes, until the mixture thickens. Whisk in the chipotle salsa. Add salt to taste. MAKE THE LIME CREMA: Combine all ingredients in a bowl and stir well to combine. Taste and adjust seasoning as necessary. ASSEMBLY: Place the latkes on a serving dish. Sprinkle with the black beans and corn. Drizzle the nacho "cheese" sauce over the latkes. Spoon the pico de gallo on top. Sprinkle with the olives, avocado, and green onions. Drizzle more nacho "cheese" sauce on top and add a dollop or two of lime crema. This recipe makes a batch of 12 latkes - just enough for a plate of these delicious Latke Nachos. Latkes go so fast in my house that I can barely keep up with the demand! Because of the heavy prep involved, I usually triple the recipe and make a huge batch that the family can eat all week long. They also freeze really well, so you can store and reheat to make Latke Nachos whenever the craving calls! « Vegan Butternut Squash Gratin + More Thanksgiving Ideas! These sound and look so incredibly delicious! Have bookmarked to make soon!! Look and sound delicious! I love Mexican-inspired food! Stephanie is a genius! I can't wait to make these latke nachos! it sound so delicious. I will must try this. Stephanie is awesome! I love how creative this dish is. My husband and I made latkes, or potato pancakes as we call them, last weekend. They're one of my favorite ways to eat potatoes. I have to try them as nachos! Definitely a way to make them standout! How delish!